Usually, we order take out from Curry Point, an Indian restaurant over on Greenpoint. Curry Point’s food is delicious, cheap, and sets the bar for Sunnyside Indian cuisine. At Saffron Garden, we started with the vegetable samosa. The exterior of the samosa was light and didn’t taste fried, but baked instead. The innards were a finely, mildly spiced mixture of ground vegetables. 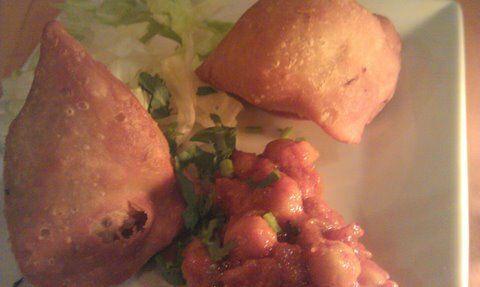 The samosa were accompanied by a cold chickpea chutney of sorts, which was good, as well. I think Saffron Garden’s samosa tasted better than those of Curry Point, where the samosa have a lingering fried flavor. For our entrees, we ordered chana masala and chicken tikka masala (although the menu said “chicken tikka marsala” as though we were in some kind of Indian-Italian fusion restaurant). The portions were just right, though appeared modest by their depth-deceiving serving dishes. 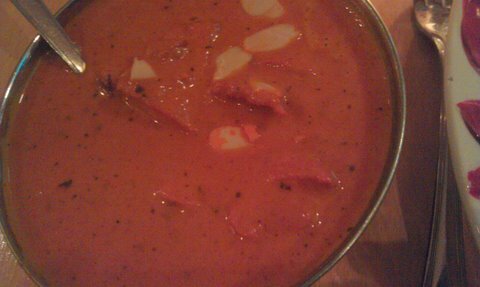 I ordered the chicken tikka masala, a tomato-buttery cream sauce with interspersed chunks of chicken marinated in yogurt and spices. The sauce tasted sweeter than that of Curry Point, and I liked it. The rice that was served with the meals was a blend of rices, rather than straight-up Basmati rice. It was delicious. My dining partner ordered the chana masala, a chick pea dish with spices. I thought it tasted good–spiced well and dense–but he said he preferred Curry Point’s rendition. Though he was unimpressed by his dish, he praised Saffron Garden’s light and tender naan. I also ordered a mango lassi, which was served with ice–an atypical feature. It was thick and creamy and delicious. We didn’t order dessert, opting for Claret’s wine menu and (out-of-this-world) Tahitian vanilla creme brulee. I recommend Saffron Garden. I hope they are able to stick around the neighborhood. Take the 7 train to 46th Street, walk north.